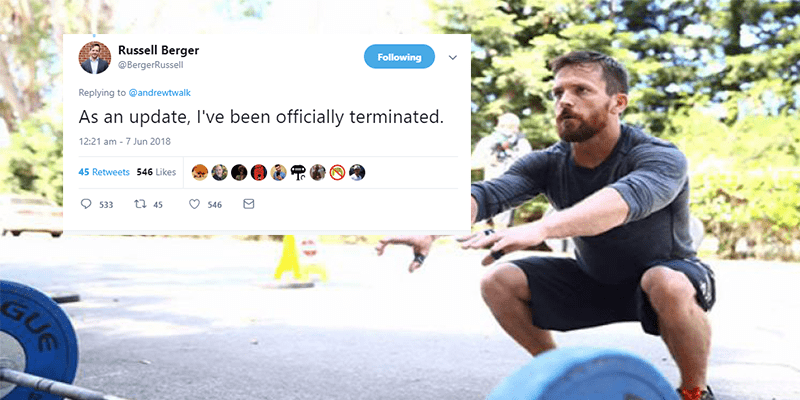 The high-ranking CrossFit employee has been fired after tweeting his support for a CrossFit gym’s cancellation of a Pride event. CrossFit HQ has fired Russell Berger after he tweeted two tweets with mocking remarks against the LGBTQ community. He made the remarks supporting a gym in Indianapolis, Indiana, where owners canceled a workout in honor of Pride Month. Many of the coaches and employees quit in protest, according to WTTV TV in Indianapolis. On Wednesday, the gym posted notices that it was shutting down. Russell Berger tweeted the following remarks, which have since been deleted. There has also been a huge backlash against Russell Berger from the CrossFit community.